Sugar comes from a variety of sources, including a tropical grass (sugar cane), sugar beets, corn (maize) and a variety of palm trees. Sugar cane is grown in tropical and semi-tropical countries around the world, and railways often provided the most economical means of getting the sugar cane to the mill and the resulting sugar to port or market. 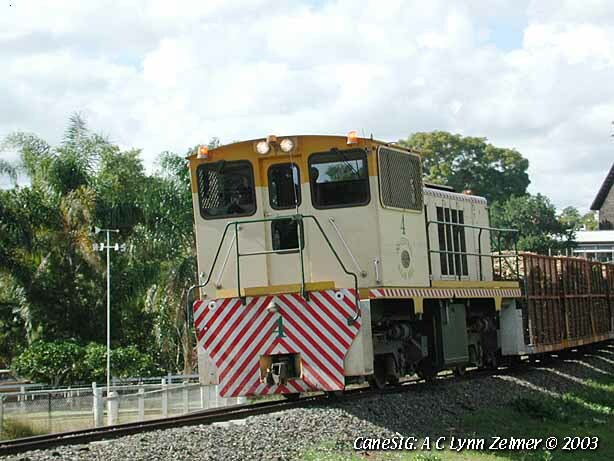 Queensland's mill-owned sugar cane railways (aka tramways) provided the main impetus for the CaneSIG website, however an attempt is being made to include materials from other sugar growing areas as well. Please contact the CaneSIG coordinator if you have information that can be shared with other modellers, railfans and historians. Photos, etc., of mills, mill railway systems and their settings. Use the mill name as a search term for Australian mills, and the country name for other countries. You can also use the photographer's name (when known), or locomotive manufacturer, etc., as the search term. Links to off-site YouTube videos showing aspects of the sugar industry, including a Queensland mill by mill series. The alphabetic listing includes direct links to most CaneSIG non-photographic resources: brochures, reports, maps and other items relating to the sugar industry within Australia and overseas. Cane Tram Notes are a continuing series of articles on topics relating to the sugar cane industry in Australia and overseas. Edited by Lynn Zelmer, and hopefully well researched, they are intended to provide background information for historians, rail enthusiasts and tourists. Individual titles are also listed on the Modelling Resources page. The Australian sugar industry as we know it today began in the 1800s with small plantations and local sugar and juice mills. As the industry expanded rivers and creeks were often used for transporting the cut cane, otherwise bullock or horse-drawn carts moved the cane to the mill. The Australian industry gained impetus with the blockades of the American civil war but by 1855 prices had dropped again and many mills were operating at a loss. This pattern of boom and bust has continued worldwide throughout the succeeding decades to the present. Cane tramways came with the expansion of growing areas and mill consolidations around the turn of the twientieth century. Portable track systems and lightweight rolling stock allowed temporary narrow gauge lines to be extended into the fields where wholestick cane was loaded by hand and the trucks pushed/pulled out to the permanent way. Surplus World War I trench railways equipment facilitated the expansion of Australian and other SE Asian tramways. Cuban and American systems, on the other hand, often used the larger equipment and operating practices of their mainline cousins. The sugar milling process also improved, from low-efficiency crushing and batch boiling to today's highly efficient semi-automated mills producing thousands of tons of raw sugar a day. However, transport of the cane to the mill remains one of the largest milling costs. Many mills operate rail transport systems to minimise these costs. In Australia tracks are typically laid on easements beside Shire roads or along farmer's fields with the rail system, locomotives and rolling stock mill owned and operated. 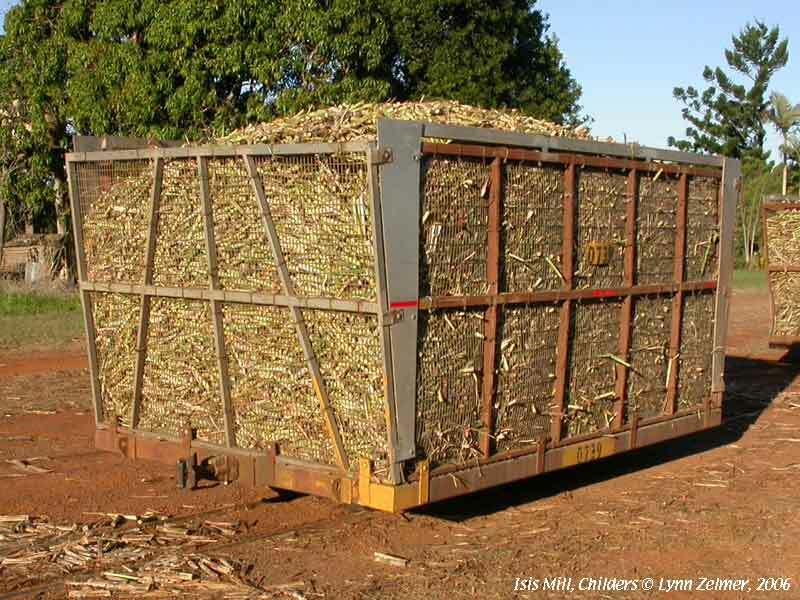 Since cut cane deteriorates fairly rapidly, the tramway system also performs an important short-term storage role. Empty wagons are delivered to the farm pick-up points just-in-time for use with full loads delivered to the mill as rapidly as possible, maintaining a constant flow of raw cane. The cutting season extends over several months (typically June to November in Australia) to optimise sugar production and minimise the infrastructure investment required. Raw sugar must still be refined before delivery to the final customer, typically at an overseas or capital city refinery. Rail systems often carried the raw sugar to the nearby port or refinery and some also transported molasses and other by-products... although increasingly road transport is being used. Sugar growers are very dependent on the world price for sugar, which fluctuates up and down as politics and the weather dictate. It seems reasonable to suggest that rising costs, low prices and urban development will hasten the end of the sugar industry in Australia, just as similar factors have effectively ended sugar production in a number of other countries. Some information in this section may be out of date in 2016. Over the years there have likely been several hundred mills in Queensland alone if one counts both 'juice' and regular mills. Some lasted a few months, others are still going strong after more than a century of service to their communities. As well, there are bulk sugar terminals at Cairns, Mourilyan, Lucinda, Townsville, Mackay, Bundaberg and Brisbane to transport bulk sugar to refineries in the capital cities and overseas. From 1955 to 2000 six mills closed: Gin Gin (1974), Qunaba (1985), Goondi (1986), North Eton (1988), Cattle Creek (1990) and Hambledon (1991). As well two mills closed their tramway systems: Harwood (NSW, 1973) and Condong (NSW, 1974). Thus the three NSW mills, Rocky Point, Maryborough, the two new mills (Tablelands and Ord, WA) have no tramways. All modern mills, except for Pioneer (1067mm), had 610mm tramways. The 2003 Australian Sugarcane Annual listed 26 mills in Queensland (Tablelands, Mossman, Mulgrave, Babinda, Mourilyan, South Johnstone, Tully, Victoria, Macknade, Invicta, Pioneer, Kalamia, Inkerman, Proserpine, Farleigh, Marian, Pleystowe, Racecourse, Plane Creek, Fairymead, Millaquin, Bingera, Isis, Maryborough, Moreton, Rocky Point) plus the three NSW mills... however, Moreton (2003), Fairymead (2004), Mourilyan (2006), Ord (WA, 2007), Pleystowe (2009) and Babinda (2011) mills have subsequently closed. Route kilometres are a bit harder to provide, however, in 2004 the Sugar Research Institute indicated "Queensland sugar mill owners own, operate and maintain 4100 km of narrow gauge (610 mm) railway...". [*] This figure does not take into account recent mill closures and the removal of their tracks or new track being built for mill interconnection. A small amount of cane is also carried on Queensland Rail tracks. [*] www.sri.org.au/sugarindustry1.html, accessed 26 Jul 04. Mill Locomotive lists (full listings): 2005 (Browning-LRRSA), 2004 (Chris Walters); 1978 (Browning/Mewes-ANGRMS), all pdf files. Individual mill extracts below where applicable. 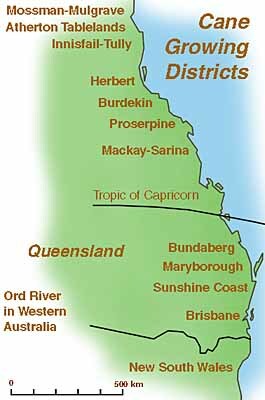 The Queensland, NSW, and WA mills below, some of which are no longer in existence, illustrate the geographic, political, historical and social factors affecting the sugar industry. Most of the operational mills still have some form of railway delivering cut cane to the mill, and/or within the mill, and/or transporting sugar and other milling products. Practically speaking, road transport has taken (or is taking) over many of these functions. Additional details on individual mills may be available in pdf format from the Modelling Resources page and or the Sugar in the News page. Photos can be accessed via the Image Collection using the mill name (eg Moreton). [All links in the left hand column above]. Atherton Tablelands Mill: The Tableland Mill (MSF Sugar Ltd: Mitr Phol Sugar Corp, Thailand; Atherton Tableland Qld), formerly Bundaberg Sugar Ltd ownership, Mareeba Qld) crushes roughly 62,000 tonnes of cane harvested from almost 7000 hectares annually (2009 statistics). The mill does not have a rail network. Babinda Mill: Mill (MSF Sugar Ltd; Babinda Qld) closed 2011. Mill loco lists: 2005 (Browning), 1978 (Browning & Mewes). Bingera Mill: With the closure of Fairymead Mill, Bingera Mill is one of only two Bundaberg Sugar mills remaining in the Bundaberg area (Bundaberg Sugar Ltd: Finasucre, Belgium; Kolan South Qld). Bingera Mill's A10 #6 (Nelson & Co, Glasgow of 1865, and rebuilt by the ARHS in 1991) can often be seen operating in the Brisbane area as part of QR's Heritage Fleet. The Gin Gin Mill at Wallaville ceased crushing at the end of the 1974 season but the Wallaville Yard and out-depot still serves as an important staging point for the long haul into Bingera Mill. Broadwater Mill: Located on the Richmond River with no rail network (New South Wales Sugar Milling Cooperative; Broadwater NSW). Carmilla Tramway: Carmilla, now known as Carmila (Qld), is a cane-growing locality about 50km south of Sarina. An isolated 7km cane tramway feeder ran from Carmila Station up the south side of Carmila Creek. It was started in 1921 and closed in 1971. The Southern Cane Railway, built in 1995, extends to Karloo on the north side of Carmila Creek to take cane to the Plane Creek Mill at Sarina. The new line was built to the highest standards then seen on any cane line, allowing much higher speeds than was normal for the time. Cattle Creek Mill: Cattle Creek Mill (Finch Hatton Qld) closed 1990 and was absorbed by Marian Mill. Finch Hatton lies at the base of the Eungella Range and the cane fields extend up into the lower slopes of the range. Cane from these farms is loaded into bins in the field and is then transported to a short isolated section of track for transfer to road transport, then again onto the rails for the last distance into the mill. Mill loco lists: 1978 (Browning & Mewes; no separate listing, see pg 24). Condong Mill: Located on the Tweed River with no rail network (New South Wales Sugar Milling Cooperative; Condong NSW). Fairymead Mill: Closed 2005 (Bundaberg Sugar, Fairymead Qld). In recent years the Bundaberg Sugar Company mills (Bingera, Millaquin and Fairymead) sold to overseas interests, the Austoft cane harvestor manufacturing plant has closed and, early in 2005 Bundaberg Sugar announced the closure of Fairymead Mill. Farleigh Mill:(Mackay Sugar; Farleigh Qld) territory runs from the outskirts of Mackay north and west with, until a fairly recent diversion, a very heavy haul on its northern 'Summit' line. Farleigh Mill is part of the Mackay Sugar group but because of its relative isolation north of the river operated somewhat more independently than other Mackay Sugar Mills. Farnborough Mill: The Yeppoon Sugar Company mill and plantation at Farnborough (QLD) operated from 1883 until 1901, when labour laws were changed to stop the use of Islander labour. A short-lived plantation and mill was also established at Alton Downs (Pandora Mill), and another plantation (Cawarral Sugar Company) existed at Cawarral, but both failed with the price crash of 1884. Although cane was collected from as far away as Tanby, Zilzie and Joskeleigh the mill had many problems (including failure to sell all the company's shares, water shortage, poor roads, and low sugar prices), resulting in forclosure in 1898. A second (private) company increased the capacity of the mill from 80 to 130 tons per day (or about 2,000 tons of sugar in a season) and made other improvements. While the mill did acquire a steam traction engine for hauling, most of the heavy work was done by Kanakas (Islanders), even on the small privately owned farms beyond the plantation. With the passing of the Pacific Islands Labour Act in 1901 the mill closed and assets were disposed of over the following years. While transportation was a major problem, it is unlikely that there was sufficient water or suitable cane growing areas within the mill's likely service area to justify a mill, even if there had been a rail/tram connection. It is still possible to find some artefacts from the sugar industry on the Capricorn Coast, and the Joskeleigh Museum has a two-wheeled cart, one of the types used for hauling cane on the Farnborough Plantation (period photos also show four-wheeled carts). Goondi Mill: Established in 1885, Goondi Mill (Goondi Qld) closed in 1986 and was absorbed by Babinda and Mourilyan Mills. Mill loco lists: 1978 (Browning & Mewes). Hambledon Mill: With a cane tramway established in 1882 Hambledon Mill (Edmonton Qld) lasted until 1992 when it was absorbed by Mulgrave Mill. Harwood Mill: Located on the Clarence River with no rail network (New South Wales Sugar Milling Cooperative; Harwood NSW). CSR first established a mill on the Herbert River near Ingham in 1883; Victoria Mill grew to become, and remains, one of the most modern sugar mills in Australia. Raw sugar from it and nearby Macknade Mill is shipped from the bulk sugar terminal at Lucinda. The two mills are now operated under a single management. Mill loco lists: 2005 (Browning), 1978 Macknade and 1978 Victoria (Browning & Mewes). Huxley Mill: The former CSR mill at Huxley (Qld) was closed in 1932 and its tramway taken over by the Isis Central Mill. Inkerman Mill: (Sucrogen Ltd, Singapore; Home Hill Qld) formerly owned by Pioneer Sugar Mills Ltd (CSR Ltd). Invicta Mill: (Sucrogen Ltd, Singapore; Giru Qld) formerly owned by Haughton Sugar Co Pty Ltd (CSR Ltd)connects with Kalamia Mill using a dual gauge track shared with Pioneer Mill. Isis Mill: (Isis Central Sugar Mill Co Ltd; Cordalba Qld) established in 1896 and first crushed in 1897. Kalamia Mill: (Sucrogen Ltd, Singapore; Ayr Qld) another ex-CSR mill, connects with Invicta Mill using a dual gauge track shared with Pioneer Mill. Lucinda Point Terminal: The Lucinda Point Bulk Sugar Terminal of the Queensland Sugar Industry Corporation has a rail connection to Victoria Mill. Macknade Mill: See Herbert River above. Marian Mill:(Mackay Sugar; Marian Qld) located a few kilometres west of Mackay and incorporates the old Cattle Creek Mill rail system. Maryborough Mill: (MSF Sugar Ltd: Mitr Phol Sugar Corp, Thailand; Maryborough Qld) one of the few Queensland mills which depends totally upon highway transport to deliver cane to the mill. In recent years Maryborough Sugar attempted to increase its holdings in both Queensland and Western Australia but was ultimately purchased by overseas interests. Millaquin Mill: (Bundaberg Sugar Ltd: Finasucre, Belgium; Bundaberg Qld) one of two Bundaberg Sugar mills with the closure of Fairymead Mill and unsuccessful ventures in Northern Queensland. The layout of Strathdee's Truck Dump was changed for a new line along the river to Millaquin. Fairymead's Siding 21, which is the truck dump on the other side of the river, has also been upgraded with the rubber tyre bin pushers. These bin pushers will help reduce coupling failures as well as reduce derailments. Moreton Mill: (Nambour Qld) closed in late 2003, the victim of low international sugar prices and increasing globalisation of the sugar industry. 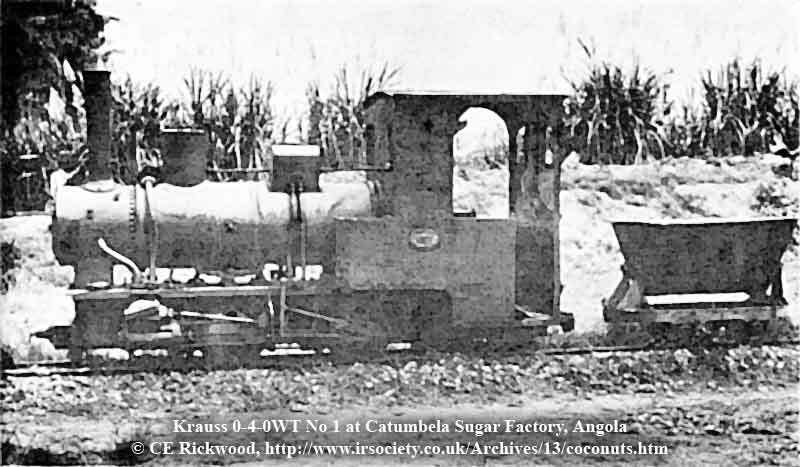 While the mill has now gone, locomotives and rolling stock was distributed among other Bundaberg Sugar (Fina Sucre of Belgium) mills and, in some cases, to preservation. Mill loco lists: 2000 (Browning), 1978 (Browning & Mewes). Mossman Mill: (Mackay Sugar; Mossman Qld) the most northerly in Queensland, and the only one operating 10-tonne bogie bins and 'canetainers' for chopped cane. Until recent years the mill operated the Bally Hooley steam train as part of its mill tour program. The Ballyhooley Steam Railway now operates a steam powered tourist railway through the resorts and cane fields near the mill. Mourilyan Mill: (Bundaberg Sugar, Mourilyan Qld) located near Innisfail Qld, the 120 year old mill was badly damaged by Cyclone Larry (2006) and never reopened. Mulgrave Mill: (MSF Sugar Ltd: Mitr Phol Sugar Corp, Thailand; Gordonvale Qld) Located beside the Bruce Highway, Mulgrave Mill is one of the most visible in northern Queensland. North Eton Mill: (Mackay Sugar; North Eton Qld) closed in 1988 and absorbed by Mackay Sugar's Pleystowe and Racecourse Mills. The loco shed at North Eton is still used for storing DH locomotives for potential conversion to 4th generation cane locomotives. Ord River Mill: Closed 2007 (Ord River area WA) and likely shipped to Thailand. Late 2012 announcements suggest that a new mill using irrigated sugar cane will be built with Chinese financing. Pioneer Mill: (Sucrogen Ltd, Singapore; Brandon Qld) only 1067mm gauge mill, sections of dual gauge track shared with Kalamia and Invicta Mills. Planecreek Mill: (Sucrogen Ltd, Singapore; Sarina Qld) located a half hour south of Mackay in Queensland, was owned by CSR and has an alcohol distillery as well as the sugar mil. Pleystowe Mill: Closed 2009 (mackay Sugar; Pleystowe Qld) located adjacent to the highway west of Mackay, with tracks running alonside the road, thus was easy for railfans to observe and photograph cane trains and their locomotives. Pleystowe Mill was shut down at the end of the 2008 crushing season and it's mill components offered for auction mid-2010. The main mill buildings have apparently been converted into Mackay Sugar's main locomotive facility and the main navvy depot has been made the main truck shop facility. Proserpine Mill: (Sucrogen Ltd, Singapore; Pleystowe Qld) until recently an independent mill, the originator of many innovations. Qunaba Mill: (Qunaba: Queensland National Bank; Burnett Heads Qld) closed in 1985 and absorbed by Millaquin and Fairymead Mills. Racecourse Mill:(Mackay Sugar; South Mackay Qld) mill and refinery located on the southern outskirts of Mackay, surrounded by residential and industrial estates. Rocky Point Mill: (WH Heck and Sons Pty Ltd; Beinleigh Qld) family owned mill at Rocky Point, near Brisbane (Mill Road, southeast of Beinleigh in the Woongoolba area), has not had a rail system since about 1950. It's the smallest mill in the state and is the last mill in private ownership. Opened in 1924, the 4.75 mile tramway was closed in 1951 following extensive flooding along the line and the availability of more efficient road transport. A new mill yard was subsequently built to accommodate transversely loaded wholestalk trucks and further expanded for bin operations. South Johnstone Mill: (MSF Sugar Ltd: Mitr Phol Sugar Corp, Thailand; South Johnstone Qld) was part of the Bundaberg Sugar (Finasucre of Belgium) group of mills in North Queensland. Tully Mill: (Tully Sugar Ltd: Cofco, China) a formerly independent mill in North Queensland, has a relatively large number of ex-mainline DH locomotives converted to 2' gauge. Wallaville Out-Depot (Bundaberg Sugar, Wallaville Qld): The Gin Gin Mill at Wallaville ceased crushing at the end of the 1974 season but the Wallaville Yard and out-depot still serves as an important staging point for the long haul into Bingera Mill. Victoria Mill: See Herbert River above. CE Rickwood visited the Sociedad Agricola Cassequel Limitada, who own a sugar mill at Catumbela (on the coastal plain between Lobito and Benguela), in the 1960s. Their primitive open air museum of 60cm equipment included a Krauss (right): Rickwood, CE (1967). '''Coconuts, Cane and Coffee', downloaded 17 April 2009 from The Industrial Railway Record, 13: March, pp 20-25/33 (http://www.irsociety.co.uk/Archives/13/coconuts.htm). Ledesma: Ledesma SAAI is Argentina's largest sugar producer and is likely one of the largest sugar cane based processing companies (sugar, cellulose, paper, alcohol) in the world. The history of the mill can be traced back to 1830 when a primitive mill in the San Lorenzo River valley yielded around 759 tons of sugar a year. The mill has used both 508mm and 700mm gauge railways, although the 508mm gauge system had disappeared by the time the photo above was taken. Further details of the 700mm mill railway as it was in 1982 can be found in Latin Tracks magazine: Thomas, Daniel (2007). 'The cane trains of Ledesma'; Latin Tracks, #27, pp 35-46, and a series of 'postcard'-type short articles in Narrow Gauge Downunder magazine starting October 2008. 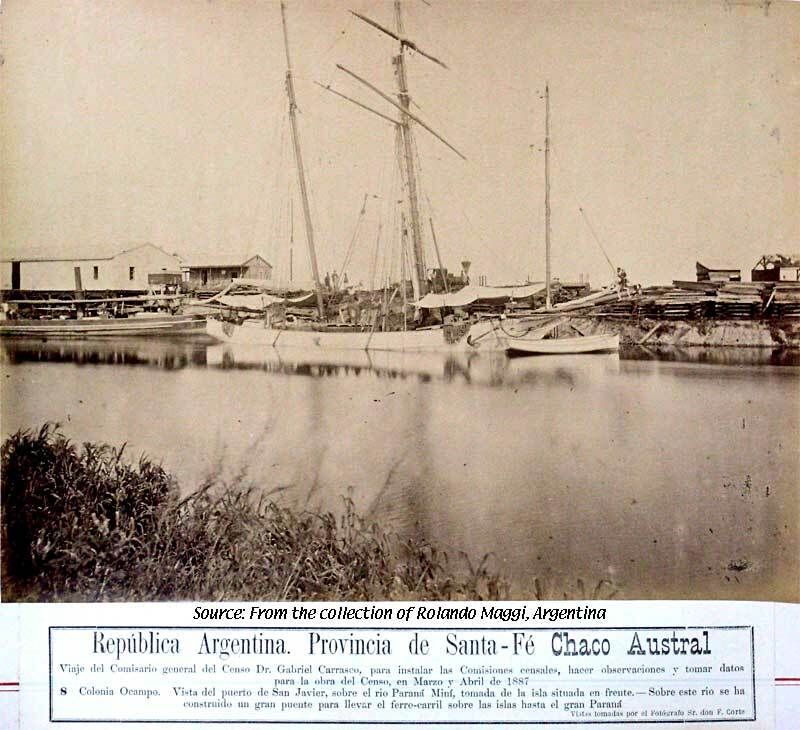 Ocampo: One of the three river ports of Colonia Ocampo (right) in Argentina's northern Santa Fe Province. "This enterprise of Mr. Manuel Ocampo (a Peruvian who migrated to Argentina in the 19th Century) was a big land and agro-industrial development: three ports, two railways -- meter line and Decauville line, two 'Ingenios' (sugar mills) -- 'Manolo' and 'Tacuarendí', a distillery ('Adelaida'), quebracho and other noble trees timber factory ('aserradero'), the town Villa Ocampo and other items. "The sugar cane planted come from Guadalupe and Reunión Islands; a French engineer planned and executed all the works." Text and photo provided by Rolando Maggi, Argentine. Santa Fe, Argentina, 1999: A short report on the sugar industry in Santa Fe, Argentina. In Spanish. Extracted from: Libro / Book : "Alimentos Santafesinos", Autor: Ministerio de la Producción / Ministry of the Production, Gobierno de la Provincia de Santa Fe / Santa Fe's Provincial Government, Ciudad de Santa Fe / City of Santa Fe, 1999. Photo: Harvest time in Santa Fe area. Photo from Alimentos Santafesinos. Brazil is a major sugar producer, and has a corporatised system of large sugar mills. Of special interest to world sugar prices, government policy directs the output of the mills into either sugar or ethanol production depending upon world prices and the country's current needs. 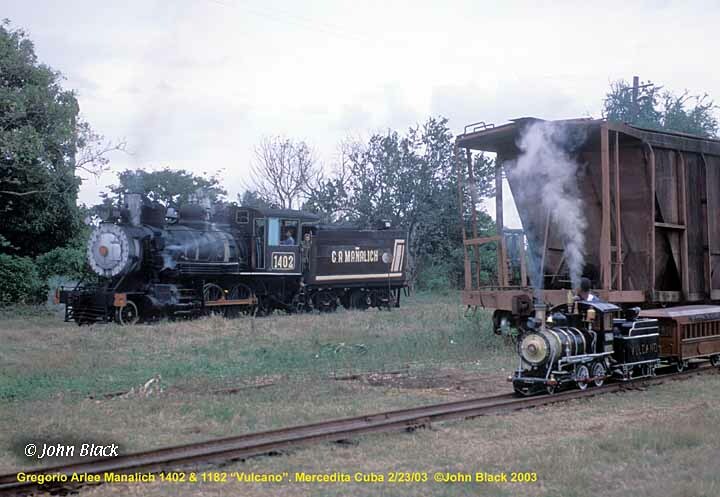 Cuba has been a popular railfan destination for decades, with a variety of books, videos, and photo CDs available (see the Bibliography on the Modelling Resources page for a selection). Use photographers John Black or Claus Kleinhapl as search terms in the Image Collection for photographs. 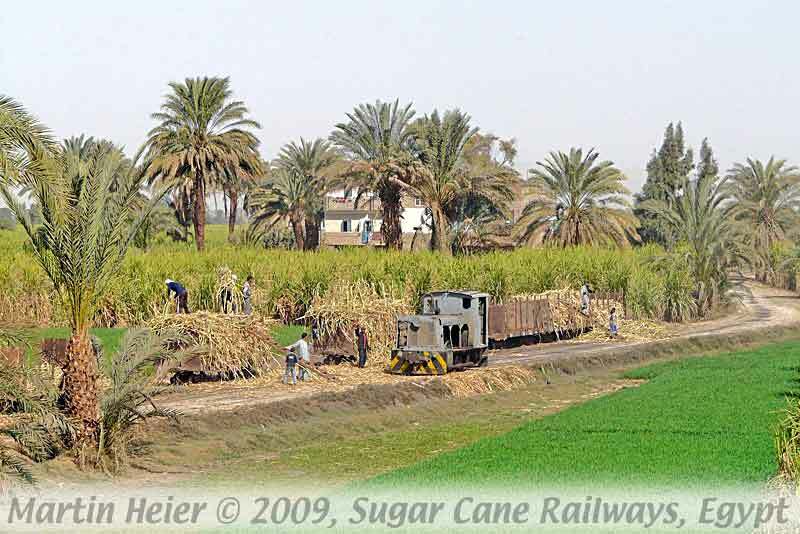 Further information from LOK Report: Zuckerrohr feldbahnen in Oberägypten (Sugarcane field railways in Upper Egypt) or this 2009 download. 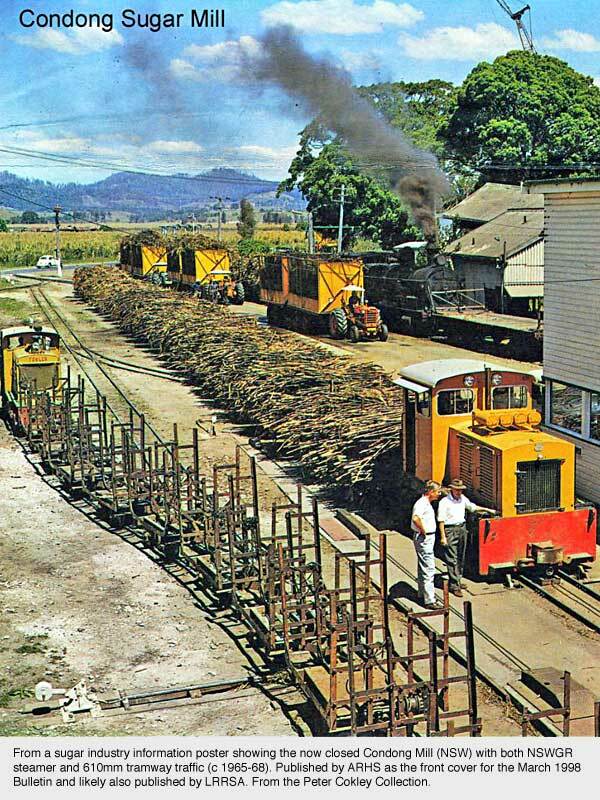 While the cane railways are now operated by FSC (Fiji Sugar Corporation) most of the mills and their rail operations were initially developed by CSR and parallel similar developments in Australia. Visitors to the Fijian cane fields and mill railways will see a very run down system, but one that is still very reminiscent of the 1960s in Queensland. Much of the cane is still hand cut and, while the mills did introduce some chopped cane bins, they have reverted to wholestick trucks on the rail lines due to maintenance problems with the bins. The result is long lines of trucks waiting to unload at the mills and a very slow and accident-prone rail system. Fiji is Australia's closest overseas sugar producing neighbour, and the mill/tramway system was developed similarly to that in Australia. As a result, the Fijian rail systems are quite well reported in Light Railways (LRRSA) and fairly intensively photographed. 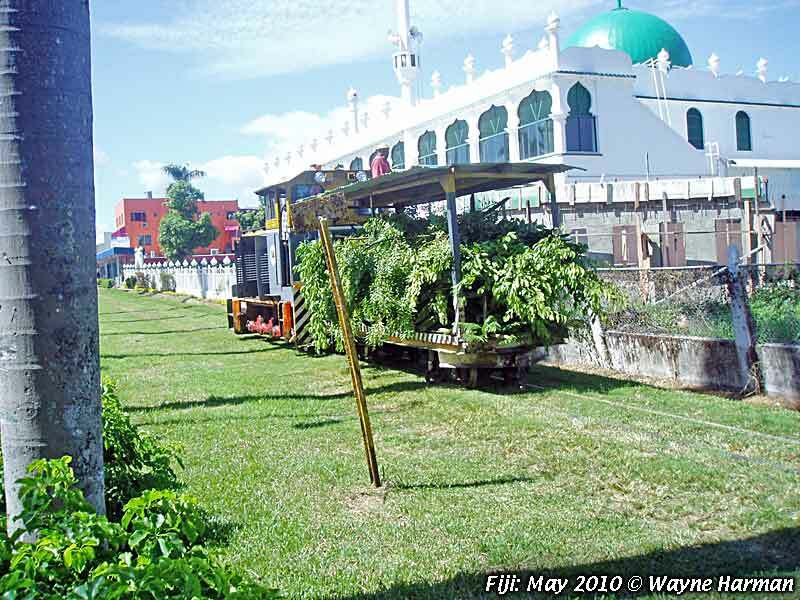 See Fiji Over the Years - 1963-2008: (Cane Tram Notes) [2.6 Mb pdf file]. Using Fsugar as a search term in the Image Collection will retrieve over 500 images. The LRRSA has a variety of print resources on Fiji, with current details in Light Railways. Aside from this web site, the best single resource for Fiji's cane trams is Dyer, Peter & Hodge, Peter (1988). Cane Train, Wellington, NZ: The New Zealand Railway and Locomotive Society Inc. ISBN: 0-908573-50-2. It includes photos, plans, maps, etc. While I worked in India for more than a year, I never managed to get many photos of the Indian railways, and none of the cane growing areas that I visited had any obvious cane railways. However these two photos provide a glimpse of Indian sugar cane operations. 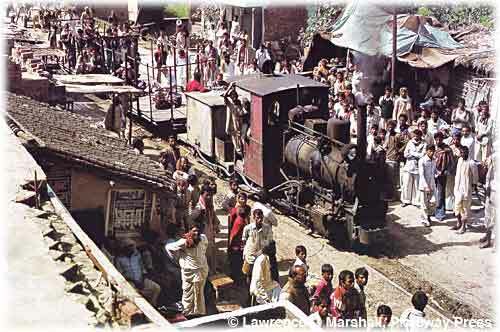 The photo right particularly evokes memories for me, not only because of the steam locomotive, but also the houses and people close to the tracks so typical of rural India and Sri Lanka. Above left: Saraya Sugar Factory's #54, a narrow gauge Kitson-built 0-6-0 with a loaded train of cane in 1993. Above right: Purtabpore Sugar Factory's #2, returning to the sugar factory with a special excursion train in 1984. Both photos from Marshall, Lawrence G (2001). Indian Narrow Gauge Remembered, East Harling, Norfolk, UK: Plateway Press. Very highly recommended. Use Java as the search term for Javanese photos in the Image Collection. Many of the photos were taken by John Browning on organised railfan tours and his 2008 trip was the subject of a January 2013 Narrow Gauge Downunder magazine article, complete with modelling examples. The Dutch established the sugar industry in Java with much of the production prior to 1930 going for export, especially to India. However, the depression, the loss of the Indian market with the British setting up plantations there, the WWII Japanese occupation, and more recent urbanisation, saw much of the sugar cane growing land turned to rice or housing. Original steam driven machinery continues in use in many of the remaining mills and some of the narrow gauge railways used to transport the wholestick cane to the mill still survive. 700mm gauge predominates, but mill railway gauges ranged from 600mm to 750mm. Many of the mills use relatively modern Japanese diesel locomotives but some still use steam locomotives of German or Dutch origin. The use of narrow gauge railways for transporting cane to the sugar mill has largely been abandoned in favour of road trucks hauling cane to transfer points (transloaders) for final delivery by wholestick truck into the mill. However portable track and hand/bullock power are still used in some areas to transfer cane from the field to a more permanent track. Steam locomotives are usually fuelled with firewood. However some are fired with bagasse (fibrous cane residue after crushing, dried and bundled), requiring large roofed tenders to carry the low quality fuel. Bagasse bundles will also sometimes be stacked on any horizontal surface of the locomotive. [Photo above: Padjarakan Sugar Mill, Java: #4 (0-4-0 DM, ex 4wDM, Schola 700mm gauge), John Browning photographer, on his 2012 Christmas card (pdf file)]. 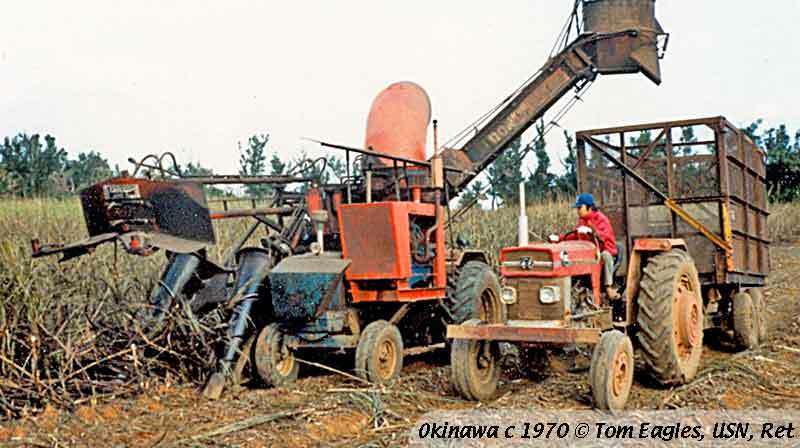 Okinawa, Japan c 1970 (right): a tractor-mounted mechanical harvester is ready to load a tractor-hauled four wheel trailer with cane bin following alongside. The height of the leading topper suggests that the cane variety being harvested is fairly short. The bin looks to be narrower than an Australian bin, but the height suggests it likely has a 4-6 ton capacity. While the first rail line (opened with handcars) in Okinawa was laid down in 1902 Okinawa Island's first railroad opened in 1910, for the transportation of sugar cane. Under the American Occupation, the road system of Okinawa developed markedly, and the prefectural railway and the Okinawa trolley line disappeared. The industrial rail systems disappeared, too, with the exception of the Minami Daito sugar-cane line, which returned to operation and continued to operate until 1983. Okinawa Railway: Although the original intent was to transport sugar cane by handcar to the refinery in Nishihara, the line was unused in the off-season, and the operator set up a separate company to provide passenger service on the line. It opened in November 1914, providing service between Yonabaru and Konaha, extended its route to Awase in 1916 and ceased operations in 1944. 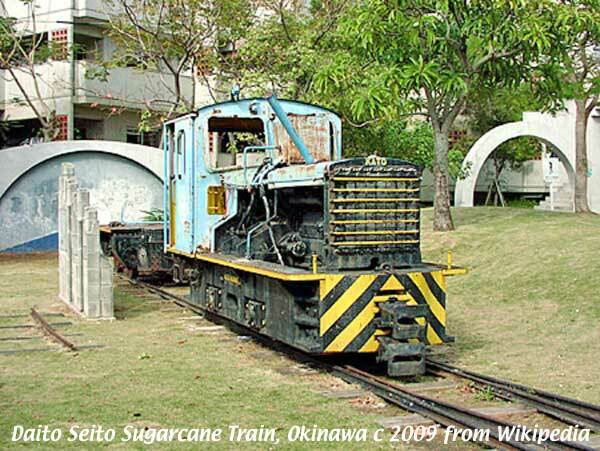 Daito Sugar Train: The line that operated on Minami Daito Island, now preserved at a park in Naha, is known by various names including "Minami Daito-jima Sato Tetsudo" and "Minami Daito-jima Sugar Train". The first rails laid down in Okinawa included lines that encircled the island and others that relayed traffic to the harbor. The tracks exceeded 30 km in length. 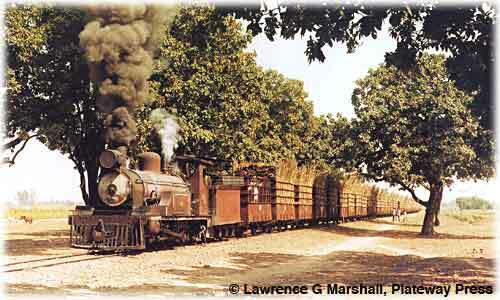 In addition to hauling sugar cane, they also conveyed passengers and mails. In the Meiji period, Minami Daito was uninhabited, but in 1900, Tamaoki Shokai began to develop the island, and started both the sugar refinery and the handcar railway in 1902. In 1917 the commercial rights passed to Toyo Sugar Refining. 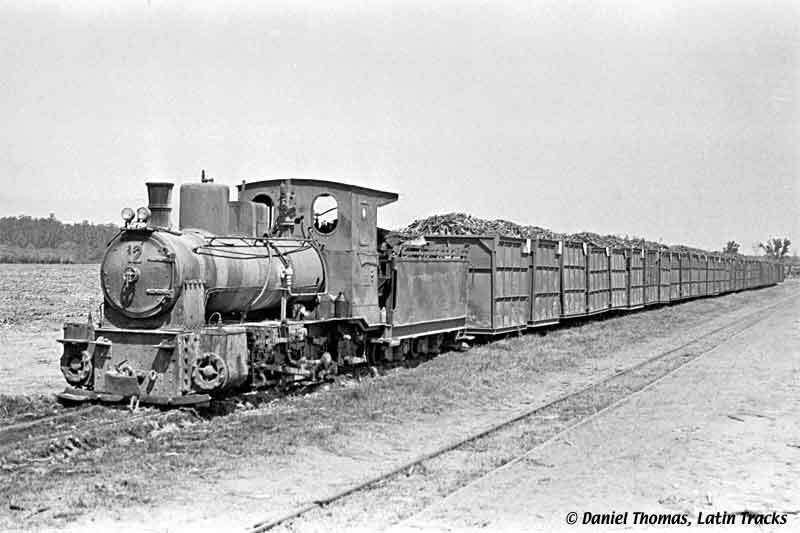 The railway was converted to a gauge of 762 mm and began seriously hauling sugar cane. In 1927, Toyo merged with Dainippon Sugar Refining. During World War II, aerial attacks destroyed the railway, but in 1950, Daito Sugar Refining restored it to operation. It served through the 1983 spring season, and thereafter, trucks replaced the railway for the transportation of sugar cane. The upgrade of the gauge to 762 mm had permitted the use of steam locomotives, and in 1956 diesel locomotives were introduced. At present, steam and diesel locomotives, passenger and freight cars have been preserved on Minami Daito. Other: Prior to World War II the islands of Ishigaki and Miyako also had lines to move sugar cane. Tom Eagles' Photos: Tom Eagles visited Okinawa circa 1970 during one of his tours in Vietnam. Tom was a Navy medic attached to the Marine Corps and is highly decorated for his service in the Vietnam war. 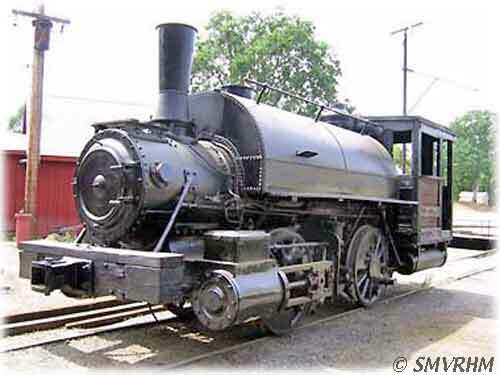 He is still very active in the 7/8n2 narrow gauge hobby, and models Maine two foot. Tom says that in finding this place he had no camera, but there was a small country store with a Kodak instant camera of the type they used to sell. He found a piece of lumber and used that for a tripod, so the photos are quite clear considering the poor equipment used to take them. The photos were scanned by Steve King and are used with permission. Use Okinawa or jsugar as a search term in the Image Collection. 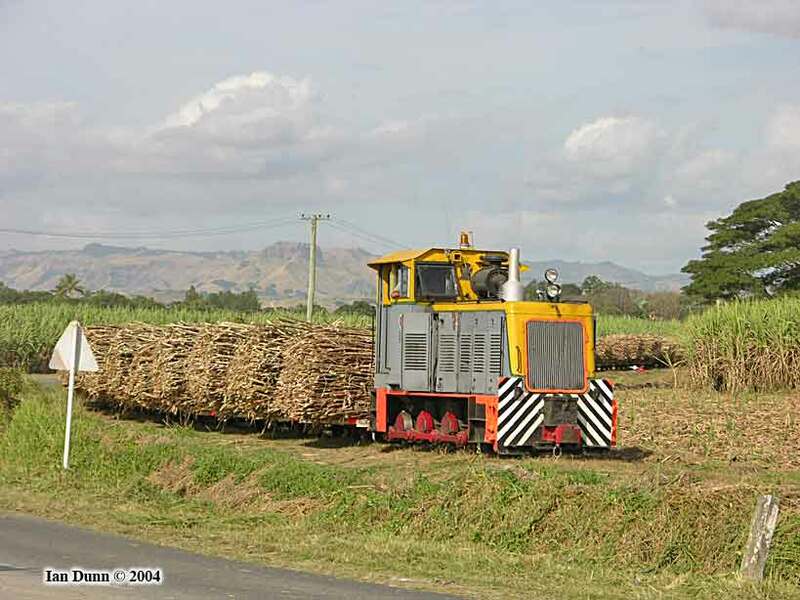 While the Philippines has been a major sugar producer CaneSIG has had limited resources on the sugar cane railways serving the Filipino industry. However, railfan and modeller Jon Knudsen, who travelled there in October 2005 and posted more than 300 images on his now defunct web site. Fortunately he has provided a small selection for CaneSIG. Use psugar as a search term in the Image Collection for full size versions of all images. The traditional use of bigasse (cane crushing residue) for fueling the steam locomotives can be seen from the high sides and roof on the abandoned steam locomotive tender (above right). There appear to be two types of wholestick cane wagon -- both are essentially flat wagons with high bulkheads, but one type also has a horizontal tie-bar at the top of one side. Hans Hufnagel's 1985 visit to Central Azucarera de Tarlac (Luzon Island, Philippines) is recorded in Cane Tram Note #15. His 1985 images from Tarlac and other mills are in a slideshow (mp4) format. A Taiwanese railfan (CityCat) maintains a web site with photographs and other information on the railways of Taiwan, including the rail lines used by several sugar mills. His historical images are of particular interest (Sugar Railways in Taiwan - 1, about half way down his index page), although there is a good selection of modern sugar cane operations on his photo pages. Right: Diema DH from CityCat Photos page 2. While some of the early plantations used narrow gauge portable rail systems and light equipment, more recent mainland American practice followed US conventional railway practice. 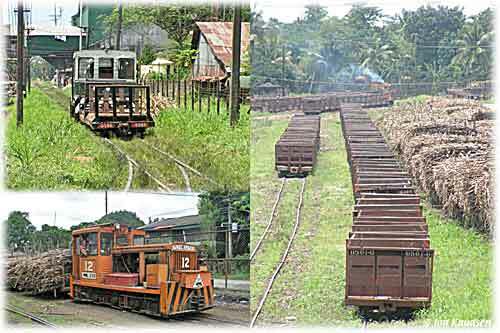 In recent decades the standard gauge railways carried cane during the crushing season. The content in this site is likely representative of other sugar cane operations in the same areas. CaneSIG primarily provides resources for modellers of tropical sugar cane railways. However, sugar is also produced in more temperate areas from sugar beet, corn (maize) and other crops. Betteravia is an example of beets delivered to a sugar mill by rail using open gondolas. The Union Sugar Company mill at Betteravia, California began production in the 1899 harvest season and produced 1607 tons of sugar from 16,000 tons of sugar beet. Union Sugar, named to represent the union of interests of San Luis Obispo and Santa Barbara Counties, was conceived in the late 1800s and began operations in September of 1899. Originally serviced by the Southern Pacific Railroad and the Pacific Coast Railway, the Santa Maria Valley Railroad became involved after its inception in 1911 and continued hauling beet gondolas for the refinery until the refinery closed in 1993. US Sugar was the USA's first fully integrated sugar producer, growing, transporting, milling, refining and distributing sugar from a Florida base. Power for the refinery is even generated using bagasse, the fibrous byproduct that remains after sugar cane is crushed. 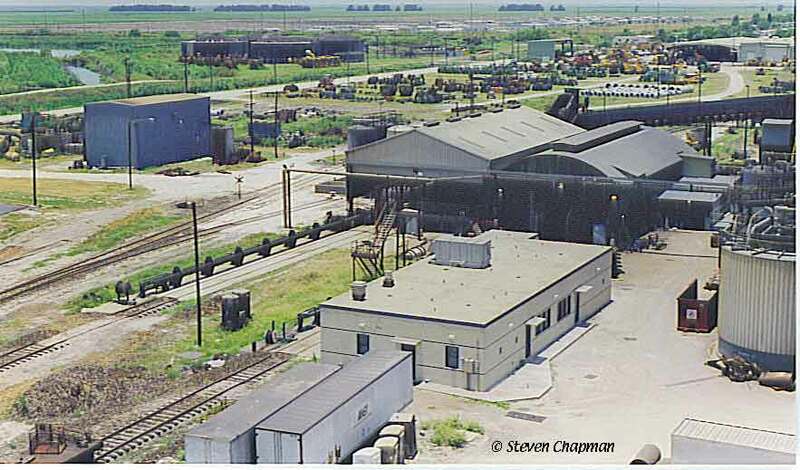 Steven Chapman's photos in and around the refinery can be retrieved from the Image Collection using [USsugar] as the search term. Other US Sugar materials are available from the Modelling Resources page. 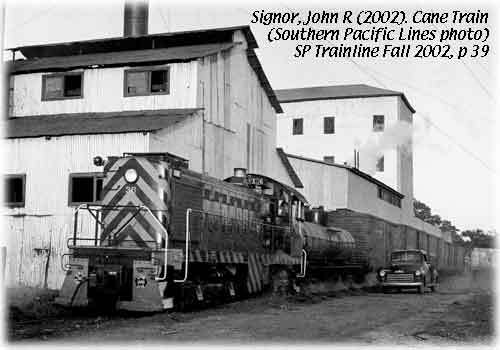 The Hawaiian sugar industry used American railway practice with a variety of relatively small steam locomotives but cane was often carried in proprietary 4 wheel Gregg (solid sides) and Fricke chain-side cane cars. 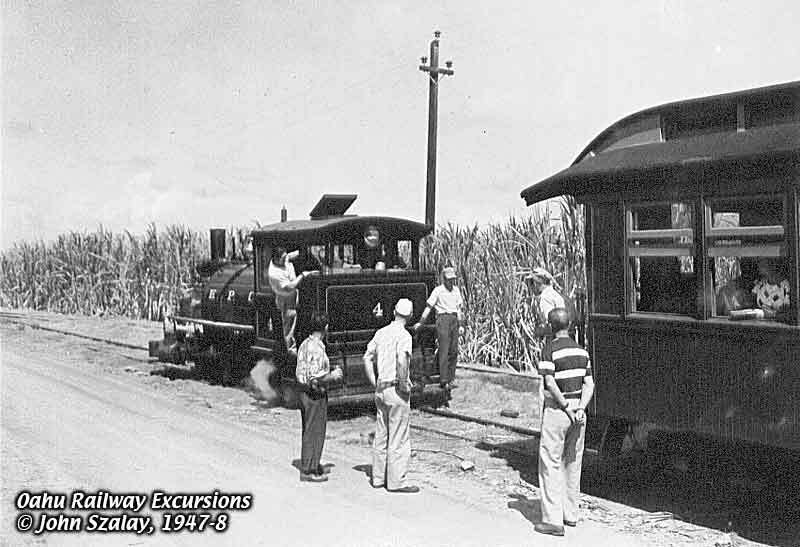 The January 1933 issue of Economic Geography had a descriptive article on the Oahu Sugar Cane Plantation, Waipahu, which was served by permanent and temporary rail lines. [Off-site JSTOR link]. Nicholas Kalis' has compiled a Cane Tram Note on the Oahu Sugar Company, Waikane [1.3 Mb]. 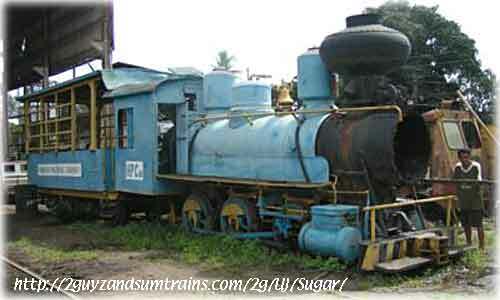 Several 'sugar cane trains' exist for tourists in Hawaii. Current information (and DVDs) should be available from Hawaiian tourist sites. 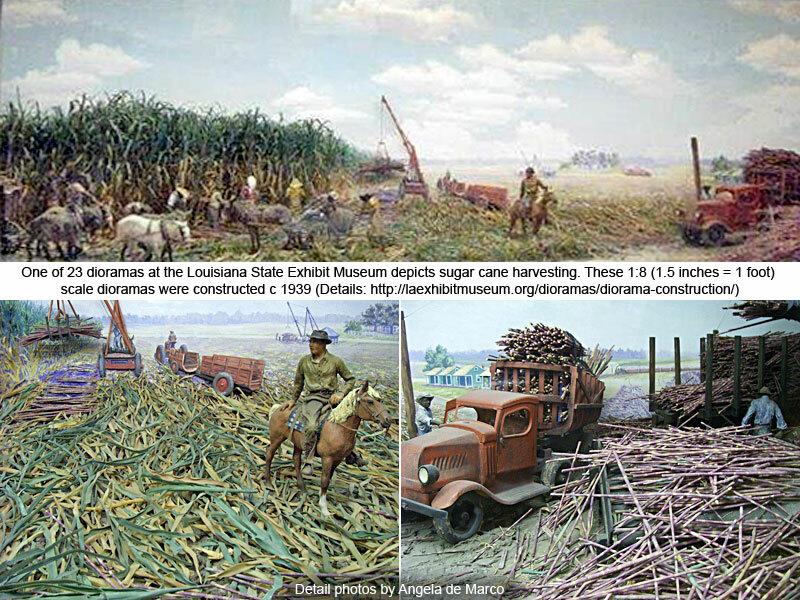 As elsewhere, early sugar cane operations were labour intensive. The Louisiana State Exhibit Museum 1939 era diorama (right) depicts the transition between manual and machine operations. Following the plantation era the Louisiana cane railway operations generally followed mainstream American practice with Southern Pacific as one of the main operators. Locomotives were typical of other regional branch lines, with cane carried in gondolas and similar freight cars. The Modelling Resources page has a link to an article on a N scale layout based on Louisiana practice.